Netflix's highly-anticipated Stranger Things Season 2 is just around the corner, and today we have new details from two returning cast members, and one newcomer. Stars Natalia Dyer (Nancy Wheeler), Joe Keery (Steve Harrington) and new casting addition Dacre Montgomery (Billy) recently spoke about their favorite guest star to emerge this season, and some of the 1980s "homework" that the Duffer Brothers gave them. Unfortunately, the actors wouldn't shed any light on the Stranger Things Season 2 cliffhanger that the Duffer Brothers teased on the Emmy Awards red carpet, but we do get some interesting story details below. Nerdist caught up with this trio of Stranger Things stars, who were first asked who their favorite guest star was this season. Aside from Dacre Montgomery, there were a bunch of other casting additions, including Sean Astin as Bob Newby, the local Radio Shack manager who starts dating Joyce Byers (Winona Ryder), much to the chagrin of Sheriff Jim Hopper (David Harbour). There is also Paul Reiser as Dr. Owens, who comes in to investigate the incident at Hawkins lab, Sadie Sink as Max, Billy's step-sister who befriends the main group of kids, and many more, but Joe Keery didn't hesitate one bit when asked who his favorite new guest star is, Brett Gelman. Here's what he had to say about this character below. "Gelman, the character he plays is so, so great. He brings this totally new thing, that's like a very new flavor to the show." We reported in November that Brett Gelman was joining the cast as a conspiracy theorist who comes to Hawkins, Indiana investigating a "cold case." The actor was cast just days after he cut ties with the Adult Swim network, due to the network's treatment of women. That came after Adult Swim executive vice president Mike Lazzo made a controversial statement, claiming that the network doesn't have many shows created by females because, "women don't tend to like conflict." Regardless, Adult Swim's loss is now Stranger Things gain. Dacre Montgomery also revealed he has enjoyed working with Sadie Sink on the series. "I speak to Sadie, who is the lovely, amazing young girl who's playing my step-sister. Just an incredible human to work with, I think, and I learned a lot from her as well, so she's great." Last month, the series started a new social media tradition called #StrangerThursdays, which always kicks off with a new poster inspired by a classic 80s movie. The initiative kicked off with a special A Nightmare on Elm Street poster, featuring Natalia Dyer's character Nancy Wheeler, with the actress revealing that was actually one of the films she watched as part of her "homework" from the Duffer Brothers. Here's what the actress had to say below. "So, I had to go back and watch some of the 80s horror movies, which weren't that scary, but A Nightmare on Elm Street was a big reference for my character. It's like, it's not that scary, but it's also very scary, so I had to watch that during the day." Joe Keery revealed that his "homework" consisted of watching young Tom Cruise movies, like Risky Business. As for Dacre Montgomery, his character Billy has been described before as the "human villain" on the show this season, and to help bring that aspect of his character to life, he watched a wide variety of big screen villains. Here's what he had to say below. "I mean, I love Jack Nicholson so I kind of went and watched all of his films, and then what's also supposed to be the top 20 villains of all time. You know, what makes them scary, other than being outwardly, a sort of caricature or stereotype of the idea of what it means to be scary. The Duffers were tossing around with me the idea of a human villain antagonist. We've seen a supernatural creature, monster, in the first season. But then, in the second season, we're playing around with the addition of a human version and how much scarier could that be, dropping itself into the narrative that already exists? And I guess that's what we played around with." 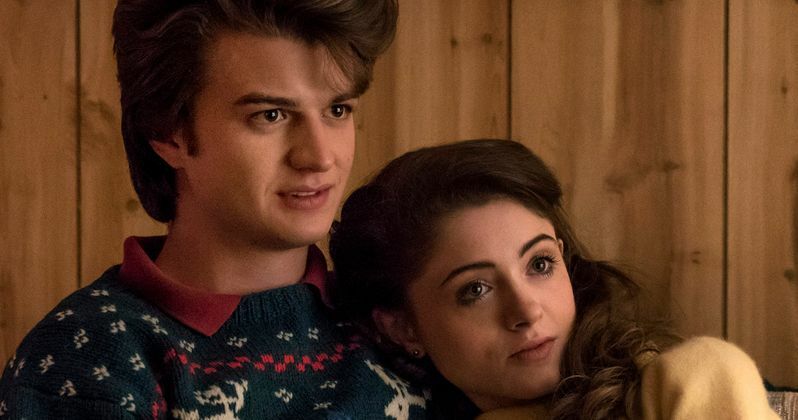 Joe Keery and Natalia Dyer also complimented both Sean Astin and Paul Reiser about how great they were to work with on the set, and hearing their stories. It remains to be seen how much more we'll learn about Stranger Things Season 2, as we get closer and closer to the October 27 premiere date. The show has already essentially been confirmed for a third season, with the Duffers also recently teasing that the show could end in the fourth or fifth season.